The history of Zen Buddhism presents itself as a family saga. Each priest of the Sôtô school today belongs to an uninterrupted line which traces itself either to Gasan Jôseki Zenji (1276-1366) or to Meihô Sotetsu Zenji (1277-1350), two disciples of Keizan Zenji, all other Japanese lines having since become extinct. One is integrated into a lineage at the time of the ceremony of Transmission of the Dharma, by which the Master makes the Disciple his successor. Presented here is the chain of teachers that connects Eihei Dôgen Zenji to Gudo Nishijima Roshi, and in the 41st generation from Dogen, Jundo James Cohen of the Treeleaf Zendo. As well, its links are said to reach back in time through China and India, on to the historical Buddha, Śhākyamuni. The line is also closely associated, ever since the middle of the 15th century, with the temple Tôkei' in, located near to the Japanese town of Shizuoka. It is a long, yet continuing history. In an important sense, it is not to be limited to any place or nation, nor is it merely a timeline which flows from past to present: In Dogen’s teachings, past is present is future, while the future flows into the past as the past becomes the future. In this way, each teacher stands for all others, and all are with us now. References: For a history of the development of Zen in Japan, please refer to William Bodiford, Sôtô Zen in Medieval Japan, Honolulu, University of Hawaii Press, 1993, as well as Heinrich Dumoulin, Zen Buddhism: A History, Volume 2 - Japan, New York, Macmillan Publishing Company, 1990. The following is a translation of the original French version by Eric Rommeluère, Dharma Heir of Nishijima Roshi and Dharma Brother to Jundo, founder of the “Un Zen Occidental” Sangha in Paris. The Zen of the Japanese Sôtô school begins from him. Born in 1200 into the highest Japanese aristocracy, Dôgen entered adolescence as a novice priest at Mount Hiei, the principal monastery of the Tendai school. 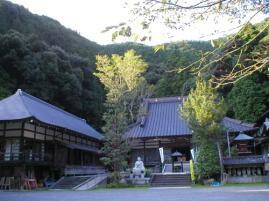 He left to study with Master Ryônen Myôzen (1184-1225) at Kenninji, where he was initiated into Zen. With Myôzen, he traveled to China in 1224. Remaining there for three years, he accepted transmission from Master Rujing (1163-1228, jap. Nyojô). On his return, he first remained close to Kyoto, where he established the initially specifically Zen monastery in Japan, Kôshôji. In 1243, Dogen left Kyoto with his disciples for the province of Echizen (the current Fukui Prefecture) where he build the monastery of Daibutsuji, renamed thereafter Eiheiji, and still one of the two head temples of Japanese Sôtô Zen Buddhism. He is the author of any number of works important to the Sôtô school and the Zen world, including the Shôbôgenzô (“Dharma Treasury of the True Eye.”) Dogen died in 1253. A member of the Fujiwara clan. 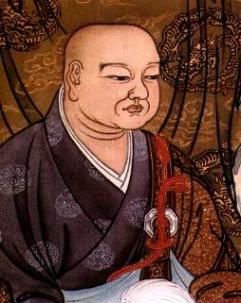 Ejô belonged to the Zen school of Dainichi Nônin (known as the Daruma-shû) prior to eventually joining Dôgen at his monastery of Kôshôji in 1234. A faithful disciple, Ejo was appointed as chief monk of Kôshôji in 1236, and assisted Dôgen in the compilation of his Shôbôgenzô. Ejo succeeded Dogen as second abbot of Eiheiji. The last years of his life were marked, however, by what is known as the “Third Generation Controversy,” which arose between Gikai, his successor, and other members of the school. After having given up his role as abbot, Ejo had to finally take it up again after the rather forced departure as abbot of Gikai. Ejo is the author of the “Samâdhi of the Treasury of the Radiant Light” (Kômyôzô Zanmai, 1278). We also owe to him the “Record of Things Heard from the Shôbôgenzô” (Shôbôgenzô Zuimonki), a compilation of extemporaneous talks by Dôgen, composed at the end of the years 1230, and always regarded as a “readable” introduction to the thought of the Master. Born to a branch of the Fujiwara clan in the province of Echizen, Gikai was originally one of the disciples of Ekan of the Daruma-shû school. 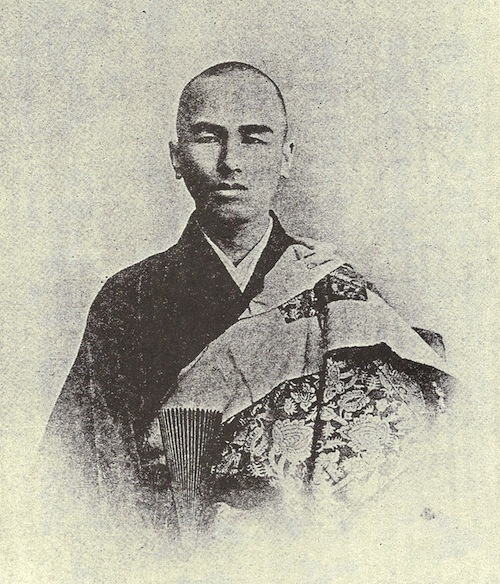 When that school was persecuted, Ekan and several of his disciples, including Gikai, joined Dogen’s community at Kôshôji. Later, at Eiheiji, he occupied the key monastic role of temple cook (jap. tenzo), and there received transmission from Ekan in 1251. After the death of Dôgen, Ejô conferred his own transmission on Gikai in 1255. Gikai may have then traveled for a few years, including to China. On his return to Eiheiji, he erected new buildings and introduced new rituals. 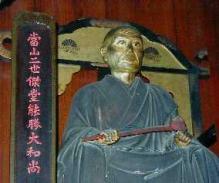 In 1267, Gikai succeeded Ejô as third abbot, but a conflict emerged with his fellows concerning his duel lineage. Finally, Gikai was forced to depart after five years spent as the head of Eiheiji. He lived many years thereafter with his mother, in a hermitage not far from Eiheiji. 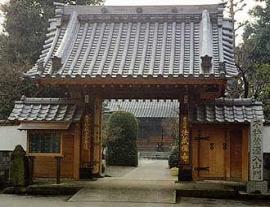 Later, he converted a monastery of the Shingon school into a Zen monastery, Daijôji, which was officially opened in 1293. 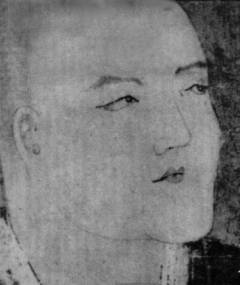 In 1271, Keizan accepted the tonsure from Gikai, then became for some time his personal attendant at Eiheiji. But it is only at the end of various travels, at the age of thirty-two, that Keizan finally joined Gikai at Daijôji. In 1295, Keizan received the transmission and the robe (jap. kesa) of Dôgen previously presented by Ejô to Gikai. Three years after, Keizan succeeded Gikai as abbot of Daijôji. Thereafter, he established the monastery of Yôkôji on the Noto peninsula, where he settled in 1317. 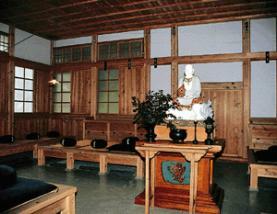 This monastery would remain the principal monastery of the immediate disciples of Keizan. He also established the monastery of Sôjiji in 1324, which would later go on to become, with Dogen’s Eiheiji, one of the two head temples of the Soto school. Keizan is the author of several works, in particular, The Three Kinds of Zen Practitioner” (Sankon Zazen Setsu), “Points to be Observed in Zazen” (Zazen Yôjinki), “The Collection of the Transmission of the Light” (Denkôroku), a series of sermons in the style of the collections of the Chinese lamp, such as “The Pure Rules of Tôkokuji,” better known under the title “The Pure Rules of Keizan” (Keizan Shingi). One of the most important figures of the Sôtô school at the end of the 14th century. A native of Mino Province (in the current prefecture of Gifu) , Baisan took the priestly vows at Genjiji, a monastery of the Vinaya school of Buddhism. He later studied Zen at Sôjiji and succeeded as heir to Taigen Sôshin. In 1382, Baisan became the abbot-founder (jap. kaisan) of a monastery in the province of Echizen (in the current prefecture of Fukui), in fact an old temple which he renamed Ryûtakuji. 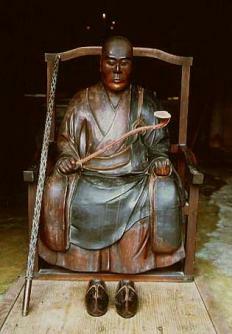 He also founded the temple of Kongôji and was the abbot of Butsudaji. Baisan was appointed in 1390 as the eleventh abbot of Sôjiji, and founded in this monastery, with the heirs to Gasan, a system of abbacy rotation. Under this system, abbots of Sojiji were to be alternatively selected from among the principal lines originating from Gasan. Baisan died in the 24th year of the Oei era . Baisan is the subject of various miraculous anecdotes. In one, Baisan is said to have once taken refuge in a deserted house, lost in the countryside, to spend the night there. But the owner of the place returned in the middle of the night, dead drunk, and took the monk for a robber, unsheathed his saber and sliced sharply the intruder. The next morning, the householder awoke and was taken with remorse when he saw, to his great surprise, Baisan calmly seated in meditation. The man exclaimed: “How is this possible?” but Baisan did not answer, being satisfied to remove from his sleeves a small statuette of Kannon which he always carried with him. The statuette was sliced into two. The man prostrated and became – as one might expect - the disciple of Baisan. Baisan is said to have had a particularly strong devotion to meditation. In the monastic code that he wrote in 1415 for his monastery Ryûtakuji, he enjoined its monks to meditate twenty-four hours out of twenty-four, if they did not have anything else to do! A native of the province of Shinano (in the current prefecture of Nagano), his family surname was Mino. 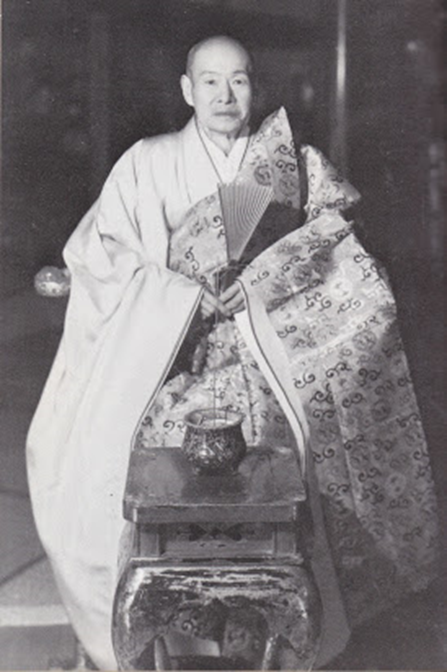 Tengin studied with the Rinzai Master Daisetsu Sonô, from whom he accepted ordination, then later with Baisan Mompon from whom he received transmission. Thereafter, Tengin went on to the province of Omi (in the current prefecture of Shiga) where he built a hermitage of the name Tôshun'in, that he soon renamed Tôju'an. A lord of the province of Tôtômi (in the current prefecture of Shizuoka) named Yamauchi then requested him to build a temple at which the lord could make prayers. In 1401, Tengin gave up all his other activities and went in search of a favorable location. He found the place guided, according to legend, by the Bodhisattva Kannon. There, he built a temple that he later named Daitô'in, inaugurated in 1411. Tengin made his own Master, Baisan Mompon, the honorary founder of the temple, with Tengin himself becoming officially the second abbot. The shogun Ashikaga Yoshimochi offered neighboring lands in donation. In 1430, Tengin took over as the Abbot of Ryûka'in in the province of Echizen (in the current prefecture of Fukui), where Tengin remained three years before returning to Tôju'in. He died in the 12th year of the Eikyô era (1440) at the age of 75 years. Before dying, Tengin required of his disciples that his funeral would remain simple and that, in the place of ceremonies, they would all assemble to sit in meditation. 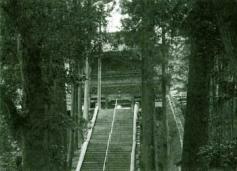 Of the 17,549 current temples of the Sôtô school, more than 3.200 trace their line to Jochû Tengin. The Zendo of Daitô' in (© Daitô' in). Second abbot of Tôkei'in. In 1452, via his brother, a vassal of Fukushima Iga No Kami, this last entrusted to Sekisô lands which were close to an old temple of Shingon Buddhism named Kikei'an, close to the current town of Shizuoka. Sekisô renamed this the Tôkei'in and dedicated it to Zen. He named his late Master, Jochû Tengin, the abbot-founder (jap. 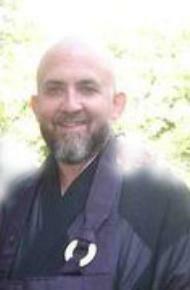 kaisan) of the temple, with himself officially becoming its second abbot. (click on photograph for a virtual visit). Third abbot of Tôkei'in, who built the entirety of its buildings at the request of his Master. Three of his disciples followed one another as head of Tôkei'in: Kensô Jôshun, Gyôshi Shôjun and Efu Keimon, who were respectively the fourth, fifth and sixth abbots. The abbacy was then assumed in turns until 1872, by each line originating from these three abbots, following the system of rotation in use in the Sôtô school. Fourth abbot of Tôkei'in. He assumed the position of abbot of Tôkei’in and Sôshinji. He also established the temple of Shinju'in in the old province of Suruga (the current prefecture of Shizuoka), and had two principal disciples, Toshun and Jisan. Third abbot of Shinju' in. Abbot-founder in 1530 of Myôonji (in the current prefecture of Nagano), his tomb stone is found there. Abbot of Shinju'in. Originally from the temple of Eimeiji (in the prefecture of Nagano), he went on to Shinju'in and, in 1592, was invited to take the direction of an old temple of the Shingon school, Fuzô'in, in the old province of Suruga (the current prefecture of Shizuoka) which he renamed Bukkokuzan Hôzôji. He became the abbot-founder (jap kaisan). Hôzôji was made a subordinate temple (jap. matsuji) of Shinju'in. The current entryway of Hôzôji. Seventeenth abbot of Hôzôji and fourth superior of the temple Tôkei'in (in the new system of classification post-Meiji). Became Third Abbot of Tokei-in in 1896, where he cared for the development and rebuilding of the temple which, despite its prestigious past, had little money during the years of Buddhist persecution of the early Meiji Period. Bukkan also planted more than six hundred plum trees in the fields nearby. For twelve years, he then served as personal attendant to Master Goyu Morita, the 64th abbot of Eiheiji. He was seen as himself a possible future head of the Soto Sect, but died young at age 42. Niwa Butsuan was the fifth abbot of the Tôkei'in and the Executive Director (kan'in) of Eiheiji monastery. Together with his Heir, Zuigaku Rempo, Butsuan was a very influential figure in the development of "Baikaryu" hymn singing in the Soto Sect. He succeeded Butsuan Emyô Niwa as superior of the Tokei'in. After having assumed the station of vice-abbot, he became in 1985 the 77th abbot of the Eiheiji monastery, one of the two principal temples of the Sôtô school. He then received the imperial title of Jikô Enkai Zenji (“Great Zen Master of Compassion, Ocean of Plenitude”). He died in September 1993 Tetsuzan Gendô Niwa succeeded him in 1986 as the abbot of Tokei'in. Zuigaku Rempô Niwa Zenji was noted for his brush calligraphy, and works by him can be found under various pen names, including Robai (“the old plum tree”) and Baian (“the plum tree hermitage”). Born in November 1919, in October 1940, he took part in a first Sesshin at the temple of Daichûji under the direction of Master Zen Kôdô Sawaki (1888-1965). In December 1973, he received ordination from Rempô Niwa, then transmission from Niwa Zenji in December 1977. He was the author of over thirty works in English and Japanese, and translated into many other languages. He died in January, 2014. 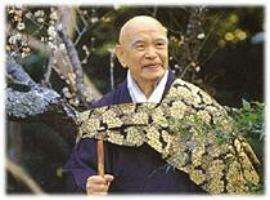 Nishijima Roshi taught "Life is just the fact in this moment; death is just the fact in this moment."